REPORT: Day of Fasting and Witness takes the Wendy's Boycott to dozens of towns nationwide! Twenty years ago last Thursday, January 18, six farmworkers broke the thirty day hunger strike they had undertaken to open the eyes of Florida tomato growers to the labor abuse and grinding poverty farmworkers faced. The workers’ momentous action represented a major step in the Coalition of Immokalee Workers’ tenacious struggle for basic rights in the fields – a struggle which, two decades later, has borne the sweet fruit of justice in the Fair Food Program. This past Thursday, over 160 clergy and faith leaders nationwide commemorated farmworkers’ historic hunger strike with their own day of fasting and prayer. The participants spread across numerous Protestant, Jewish, Catholic, and Muslim communities in nearly five dozen towns from Boston to Santa Fe and included denominational leaders Rev. John Dorhauer, General Minister and President of the United Church of Christ, and Rev. Jan Edmiston, Co-Moderator of the PC(USA). Check out our full round-up of photos and reports from the actions that amplified the call for farmworker justice in each corner of the country – and stay tuned for more as we approach the Freedom Fast March 11-15! In the Northeast, the New England Jewish Labor Committee and rabbis associated with T'ruah: The Rabbinic Call for Human Rights organized a grand total of four manager letter deliveries and actions in the Boston area outside of Wendy's locations in downtown Boston, Natick, Waltham, and Stoughton (below). Down the coast in New York City, over a dozen T'ruah rabbis and Christian clergy from Riverside Church, Middle Collegiate Church, and Union Theological Seminary decided to make their voices heard not at a Wendy's, but outside of the offices of Wendy's Board Chair Nelson Peltz in busy Midtown Manhattan. 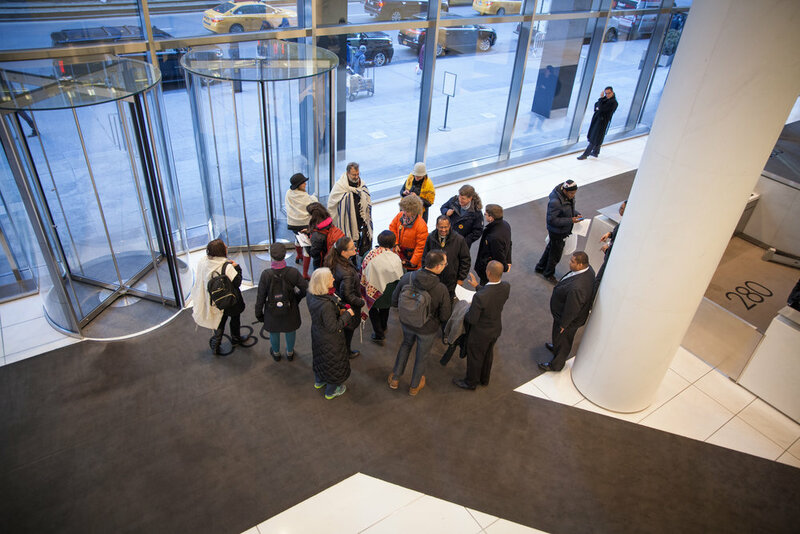 After unsuccessfully attempting to deliver their letter personally to Mr. Peltz (and successfully explaining their reasons to the security guard), the multi-faith group of fasters led a spirited picket and prayer on the public sidewalk (below). 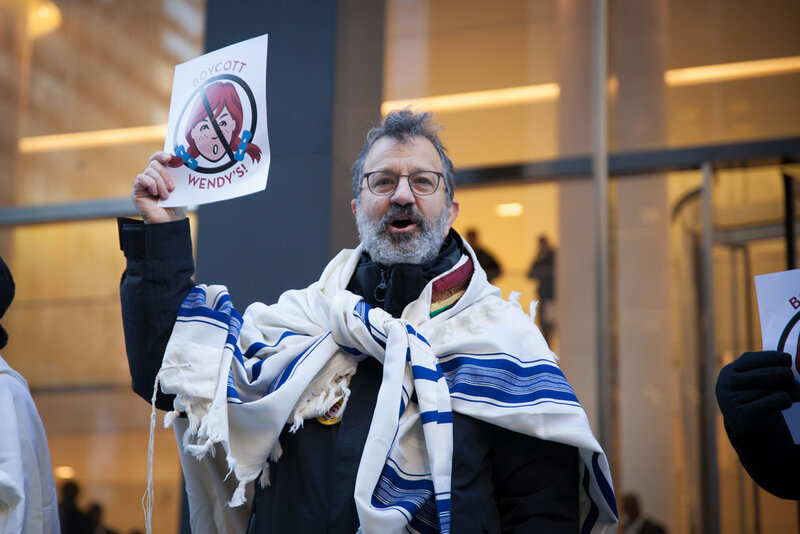 In Philadelphia, Presbyterian, UCC, and Jewish clergy organized manager letter deliveries and flyered to consumers at two Wendy's restaurants (below). Rabbis in Washington, DC and Presbyterian pastors in Owego, NY also delivered letters to local Wendy's restaurants, while clergy spread throughout New Hampshire, Connecticut, New Jersey, and Appalachian Pennsylvania put pen to paper to cast Wendy's refusal under the spotlight. In Columbus, Wendy's hometown, Protestant Christian and Jewish clergy joined forces with students from The Ohio State University to deliver a letter to the now infamous Wendy's restaurant on High Street, near OSU's campus. You can read Rabbi Jessica Shimberg's poignant reflection on the tense interaction between fasters and Wendy's customers on The Little Minyan Kehillah's blog. Faith leaders from the Presbytery of the Western Reserve in Cleveland, too, also took their message and commitment to the boycott to a local Wendy's restaurant. Chicago's below-freezing temperatures could not suppress the small but powerful letter delivery by clergy associated with Chicago Theological Seminary and longtime supporters from Interfaith Worker Justice (below). In Louisville, representatives from the national offices of the Presbyterian Church (USA), a supporter of the CIW's from back in the Taco Bell days, took homemade signs and a letter to the local Wendy's restaurant (right). Kansas's Rabbi Daniel Kirzane (of #notenoughrabbis fame) penned an op/ed that was published in the Kansas City Star on the day of the fast. You can read it in full here. Women religious from the Sisters of Charity of the Blessed Virgin Mary in Iowa and the Congregation of St. Joseph in Michigan also took part, alongside clergy in Indiana and Minnesota. Floridians came out strong in support of the National Day of Fasting and Witness, with protests lighting the way for farmworker justice up along historic U.S. Highway 41. In Ft. Myers, over 50 faith supporters and community members from Naples to Sanibel Island joined farmworkers from Immokalee for a beautiful afternoon picket and rally. Among them were allies from the late '90s who remembered and honored the farmworkers' original 30-day hunger strike. Tom Neilson, a visiting folk artist, composed a song specifically for the Fair Food movement, "A Penny A Pound," which you can listen to here. Brian McLaren's reflections, shared with the crowd, also took on a place in his blog. In Port Charlotte, the Unitarian Universalist Fellowship of Charlotte County organized a sunny Wendy's picket (right). 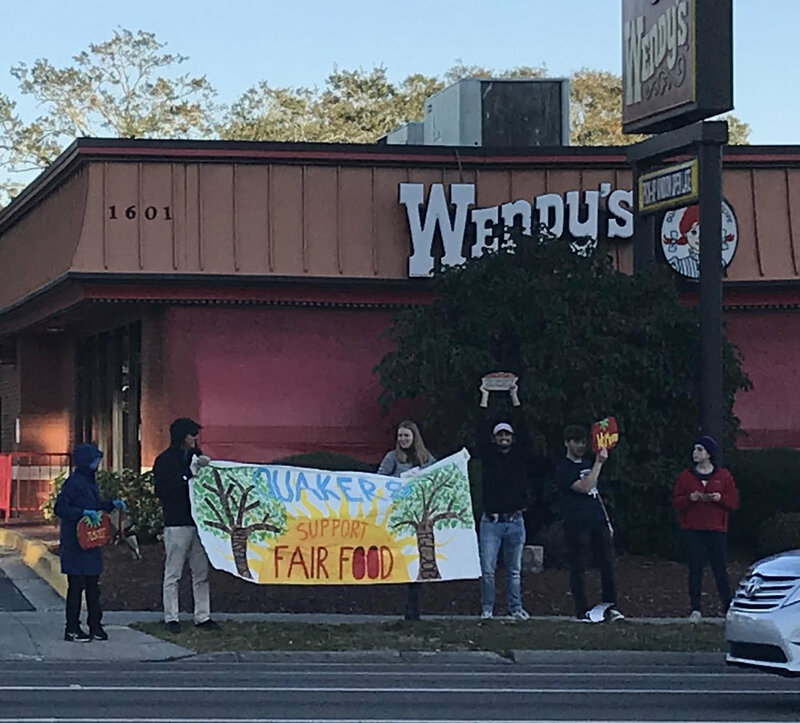 In Sarasota, the Quaker Meeting joined forces with St. Thomas More Catholic Church and students from New College of Florida and Riverview High School for a lively rush-hour protest at the Wendy's on busy US 41 (below). Up in Tampa, First United Church of Tampa clergy and churchgoers faithfully showed up at Wendy's for a letter delivery and picket at their nearby Wendy's (left). 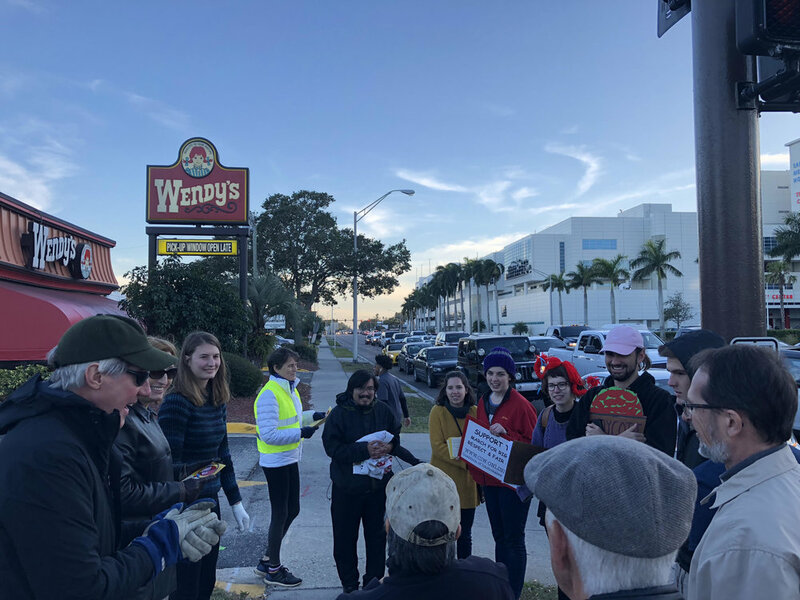 Across the bay, clergy in St. Pete also took part in the fast; while across the peninsula, members of Church of the Palms in Del Ray Beach supported their fasting clergy in delivering a letter to Wendy's. Supporters in Gainesville, Georgia, Louisiana, and North Carolina also took part in the effort! The Wendy's Boycott made its first mark in New Mexico when a group of supporters from the Santa Fe Friends Meeting connected with fasting Protestant Christian clergy and Interfaith Worker Justice New Mexico for a cold, sunny picket at Wendy's (right). In Los Angeles, a Fair Food stronghold from the Taco Bell days, T'ruah rabbis and their families led an after-school demonstration at a popular Wendy's location. Fasters in California were spread across LA, the San Francisco Bay Area, and Sebastopol, while elsewhere in the West, supporters took on the fast in Colorado, Arizona, and Oregon. With people of faith lifting up their voices, together with those of student and community allies, and calling on Wendy's to heed the moral call to support an industry that respects the dignity and personhood of farmworkers, the Fair Food Nation demonstrated that it's in this struggle for the long haul. The Freedom Fast, a five-day effort by farmworkers and allies in New York City, is just around the corner — and we are faithful that a Wendy's victory is, too.